Settle into a hotel near the Old Town, the Stare Miasto, and start exploring Krakow. And the Stare Miasto is where you'll do most of your sightseeing. The best way to see this Old Town is on foot. It's a great city for walking, but don't worry about getting tired. You'll be strolling in the Stare Miasto, entertained by the crowds and the sidewalk performers. You'll be popping into lots of churches to see the spectacular interiors and artwork. You can always sit and rest a spell and reflect in the churches. It's fun to just watch the activity on the square. It's so reasonable that you won't worry about stopping often. If you want an overview, there are choices. As soon as you start walking into the city, you'll be approached by drivers of little electric cars... or maybe they're better called carts. They offer tours exploring Krakow... and they have recordings that will tell you about the city in almost any language. 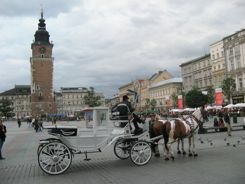 There are plenty of beautiful horse drawn carriages to show you the sights too. They seem to be a favorite of brides. Several times a day we would see brides and grooms riding in these carriages with photographers hanging off the side taking pictures. We've never seen so many brides in one city... except maybe Warsaw. Maybe we were just there in the wedding season. You'll spend a lot of time in the main market square. It's probably the first place you will wander into. It was the biggest square in medieval Europe, and it seems to be where everyone hangs out today. 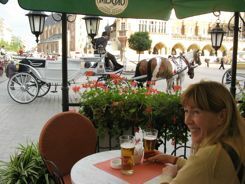 The square is filled with flower stalls and outdoor cafes.... and those horse drawn carts. Wawel Hill is where you'll find the Castle and Cathedral of the same name.... and you will have to walk uphill to get to the castle complex. There is a restaurant and a tourists office up on top. Exploring Krakow beyond the Old Town may involve taking buses or trams. Getting to the Kazimierz neighborhood is about a 20 minute walk or you can take a tram. A tram is also the best way to get to the suburb of Nowa Huta to see reminders of the Soviet past. We took a tram to see the Polish Aviation Museum. To get to the salt mines, you can take a tour, a local bus or an inexpensive mini-bus. Ask about which tram to catch at your hotel or at tourist information offices. We drove into the city. That's one way to see how big a city it is. Any highway that you take in will have signs to the Centrum. You'll know you've reached it when you hit the ring road that surrounds a park area. Planty park is a green belt just inside of the ring road. This marks where the 13th century city walls and a moat once were. Streets within this ring road are often one way. Some are pedestrian streets. Hotels are concentrated here, but getting to them by car can be a little confusing. Just take your time, drive slowly, get your landmarks, and you'll find it. We only went around twice! Ask about parking at your hotel. Whether you fly in, drive in, or take the train from another city in Poland, exploring Krakow is easy, fun, and inexpensive.